Alt-rock fans, get ready for the hottest tour of the summer!! 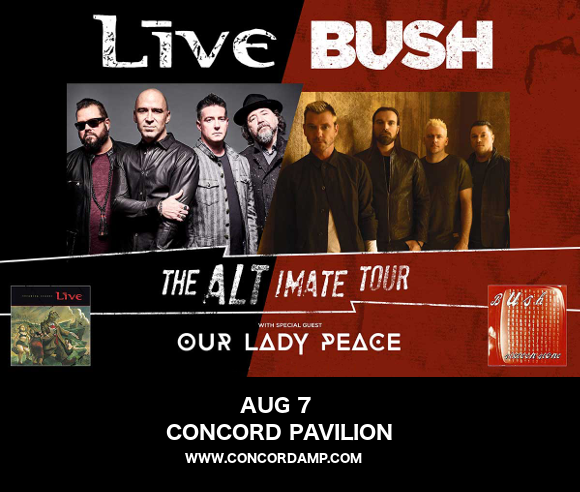 That's right, Live, Bush & Our Lady Peace are headed to the Concord Pavilion on Wednesday 7th August 2019 as part of their "ALT-imate," tour in celebration of the 25th anniversary of significant album releases by each of the three bands. Get ready to join in the party live – grab your tickets to see them today!! In 1994, Live released their second full-length studio album, "Throwing Copper." Produced by Talking Head's Jerry Harrison, it was this album that catapulted the band into the limelight, received to rave reviews from audiences and critics alike. To date, it has sold over 8 million copies, earning multiple Platinum certifications from the RIAA, making it one of their most successful releases. And finally, opening the show is Our Lady Peace, who released their debut album, “Naveed,” in 1994, to huge critical and commercial success, earning Platinum certification in Canada before the year was out. Well, what are you waiting for?? Get ready to be there and celebrate these three iconic albums with Live, Bush, and Our Lady Peace in concert – grab your tickets today! !